We had planned an extended boating trip for these first two weeks of July, however, with Tim's mother's passing, we had no time to get ready, and no real energy for the trip. Tim canceled all but one week of vacation and will take more later. 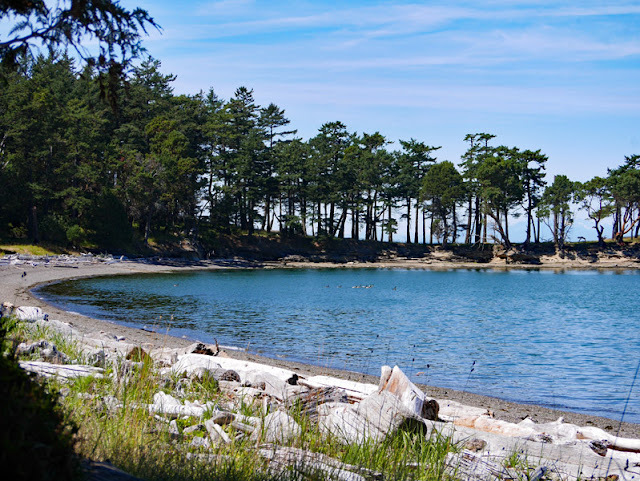 Instead, after taking care of things here in the garden for a few days, we took a short jaunt to Cabbage Island Marine Park. En route we saw seals, cormorants, bald eagles, and of course, plenty of gulls. Situated on the western edge of the Strait of Georgia, it's a bit off the beaten path. Reef Harbour lies between Cabbage Island (very small) and Tumbo Island (not quite so small). The islands are long and thin, and there are many rocky reefs to navigate. We paid close attention to our charts while the boat was pushed and pulled by strong currents. The first day there we hiked around Cabbage Island; it's about a kilometre - very short. The next day we visited Tumbo Island for a longer hike (about 5.5 km). 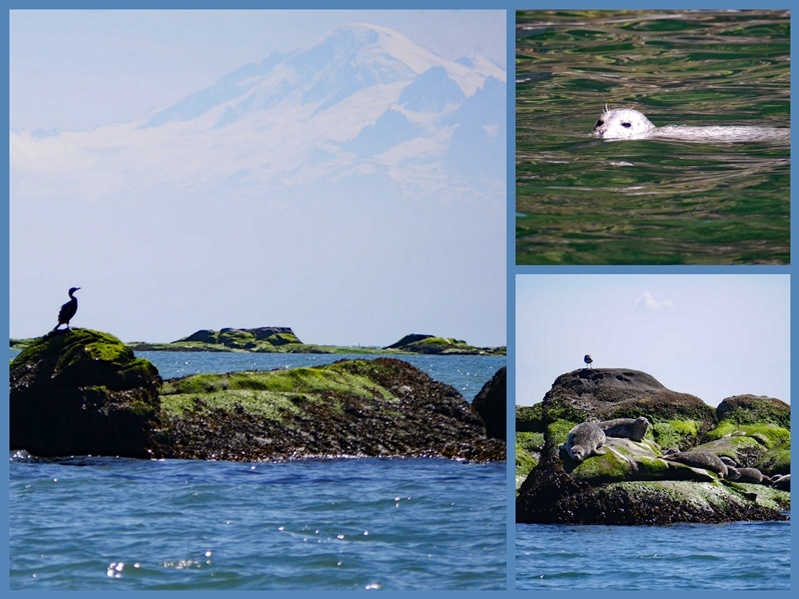 We circled this beautiful bay with views to Mount Baker in the USA. Stunning, and almost tropical - in looks - the water was chilly! A salt-water marsh to the left of the bay is home to many Canada Geese. This little family was out for a casual paddle. When the parents saw us approaching, the goslings circled close to their mother while the father placed himself between his family and the perceived threat. Beautiful Mount Baker seen from Reef Harbour. We could see across the Strait of Georgia to White Rock, BC, and towns in Washington State that we couldn't identify. One night, in the evening, as we were preparing for bed, we heard loud booms. Fireworks! It was July 4th! We saw a great show all along the beaches of Washington State, exploding light after exploding light, one after another, for at least 45 minutes. Beautiful! And no crowds! Sunset over Cabbage Island. It was a welcome and needed break. Do you like to go off the beaten path? Such beauty, you are certainly blessed living in such a beautiful area. Off the beaten track is my idea of heaven. Cabbage Island looks a perfect place, not too far and so peaceful. so beautiful... i love looking at your photos. they are amazing time after time. So you must be close to the San Juan Islands. Cabbage Island looks lovely. Enjoy the fine weather! Your vacation is the best of the best, nature's beauty and with fireworks. Thank you for sharing. The Canada Geese family melts the heart. The views are stunning. It sound like you both needed this beautiful break. I love off the beaten path in the country! Im glad you saw free, easy fireworks. You know we love boating -- and I envy your quiet waters and private islands. Just beautiful ... and a perfect way to be together, to contemplate life and to heal at a time like this ... I missed the post about your mother-in-law as we traveled ... I'm sorry for your loss. Lovely images! I'm so glad that you had the chance to relax and re-energize after everything you've gone through recently. Oh my goodness what gorgeous photos! The water, the boats, nature, the MOUNTAIN. It looks like such an amazing adventure. Thank you for posting this. Such beauty! And yes, I love going 'off the beaten path'! Glad you were able to get away to somewhere so beautiful and lovely and enjoy the break. I am sure you needed it and off the beaten path seems like a very good idea! what a fabulous trip - and the view of Mt. Baker is astounding. We don't always get that much of the mountain in our views, as the foothills obscure much of it at times. The fireworks you saw were from Blaine - the US city just across the border from White Rock - where the main border crossing is. Blaine has the good old fashioned 4th of July celebration like we had as kids: parades, events, booths of games, carnival, street food vendors and of course the fireworks over the bay - it is an event that many travel miles to participate in. Wonderful photos of your little trip - the goose family is fabulous - the colors are amazing. We like to go to little traveled spots too - though we don't have a boat. Yesterday we went to a nature reserve that we'd not known about before and saw dozens of American Pelicans (they are white) resting on an island in Padilla Bay. Quite the adventure. How I would love going off this beaten track. What a wonderful way to see the fireworks. Oh the sights you saw were just beautiful. So sorry to hear Tim's mother passed away. Sending comforting thoughts. Beautiful shots from national park. Very scenic. Hopefully, getting off beaten path was both restorative and relaxing for both you and Tim. Your phots of Mt Baker and the sunset are amazingly, beautiful. 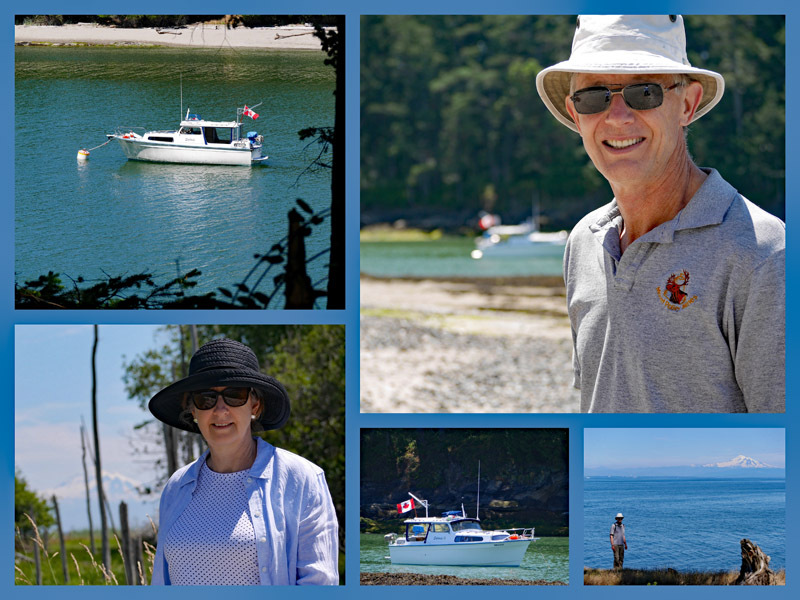 A short break on Cabbage Island will have done your both good, so sorry for your loss. The shot of Mount Baker is lovely and the sunset stunning, what an extra bonus the 4th July fireworks must have been. It is getting really hot here. Your photos look so cool. Love the roads and waterways you travel. Beautiful. Lorrie - we are all about leaving the beaten path, so I gravitate to blogs and posts like yours - thanks so much for sharing, especially in light of Tim's loss. I pray that the trip was a healing time for both of you. As an aside, I am impressed by anyone that uses charts to guide their boat!!! You had a wonderful trip, the weather is beautiful and the family goose is pretty. 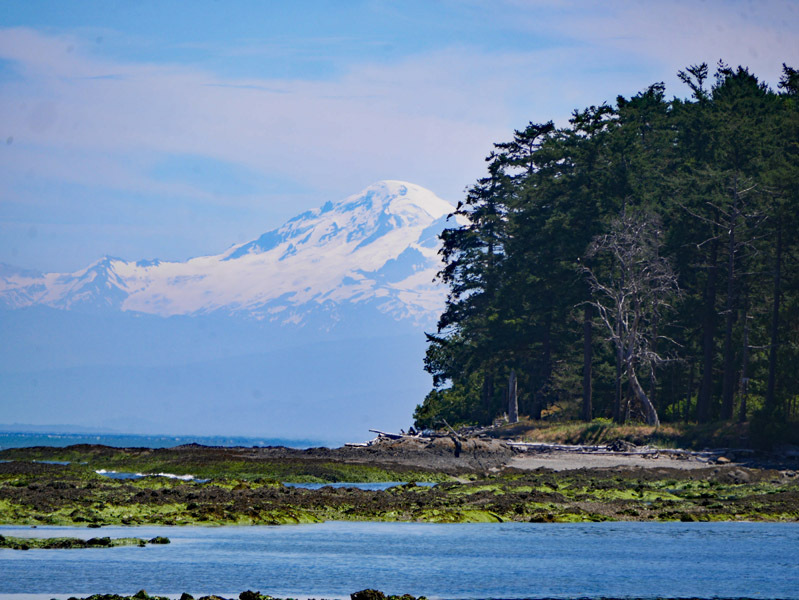 Wow,Mt Baker is floating in the blue sky!! You captured such a great moment of the mountain. It is a bit hard to capture such a moment in the humid summer of Japan.Tim and Lorrie, you are a beautiful couple! So sorry to hear Tim's mother passed away. The sadness suddenly comes. You found a lovely area to hike and enjoy some serenity. We used to do off the beaten path trips but haven't for a long time. So sorry to read about the loss. My condolences! I prefer driving the back roads, but probably don't go off the beaten path nearly enough. At least if your photos are an indication of what might be found there. So lovely. The sunset is gorgeous! I'm glad that you were able to get away. I'm sorry to hear of the loss of Tim's mother--my deepest condolences. I love to take drives like this ad you are fortunate to be able to do it on the water in a boat! Such beautiful views and seeing the goslings and beautiful sunsets. The fireworks must have been also fun to see! Lorrie, I am so sorry for your loss. Quiet, contemplative, and relaxing is a great vacation. Nice to walk the beach without navigating people or chairs. Did you see anyone on the small island? I am wanting to take sunset or sunrise over the water but that means getting to a large enough body of water to make that happen. At least an hour away. Thanks for sharing and have a great week. Sylvia D.
Love going off the beaten path... hubby and I do that whenever we're off together. It's been a while, though. Beauty in all God's creation and your lovely photos capture it.